Mikulov Wight x 1 bulb: Allium Sativum ophioscorodon (Hardneck) - From the beautiful southern Moravian town of Mikulov with its stunning castle of the Dietrichsteins. This is the garlic of the Jewish community that lived below. Violet coloured bulbs with very large cloves, approximately six to the bulb. Mikulov Wight is no longer available and will be substituted with Red Duke. Red Duke Wight x 3 bulb: Allium Sativum ophioscorodon (Hardneck) - The last stronghold of rare exotic hardnecks with fierce and spicy flavours is in Eastern Europe. 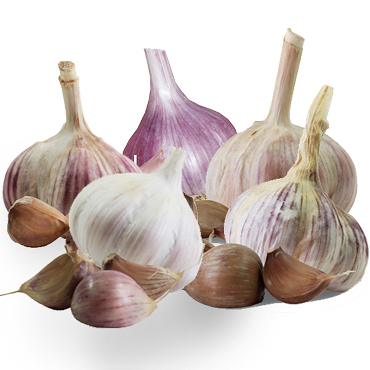 Hotter and stronger than any of the commonly planted garlic in the UK. Caulk Wight x 2 bulb: Allium Sativum ophioscorodon (Hardneck) - From the north of Bohemia, close to Prague. Creamy appearance with slightly purplish, large cloves. Tall, erect stem and leaves over metre high. This is the earliest Heritage hardneck to harvest and will keep well until February. Please note: Photo may vary from contents, the contents of this pack is listed above in the product description.